Adventures. Climbing. 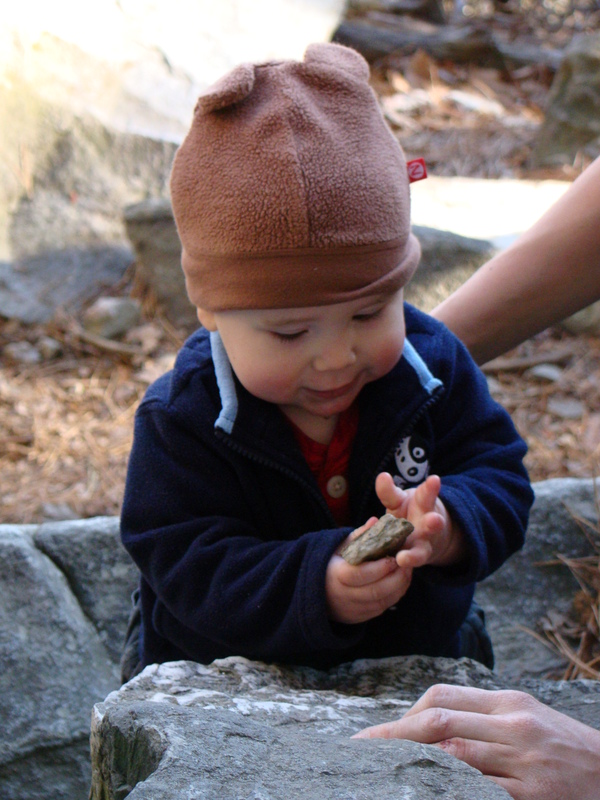 Creating a Cragbaby. Cragbaby doing a little drop-testing with the gear. 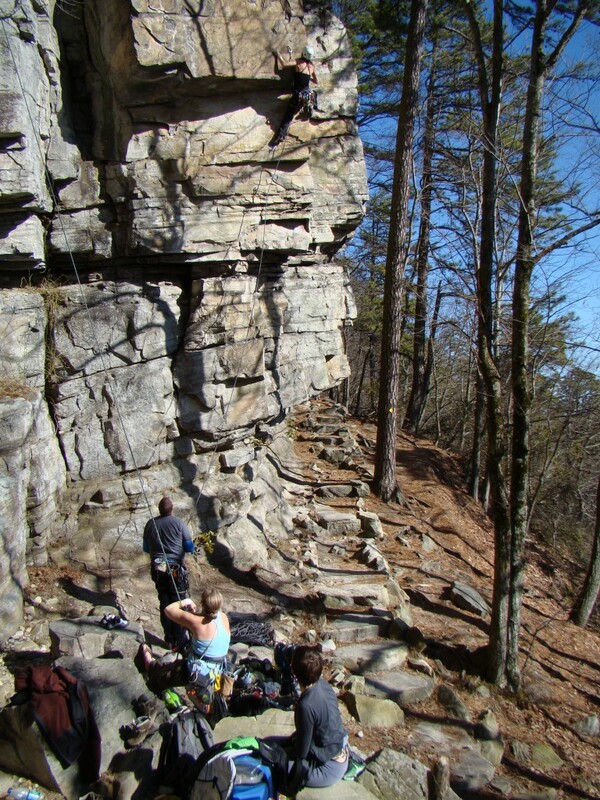 Sunny, highs in the 50’s in February…thats enough to draw a crowd at just about any crag. 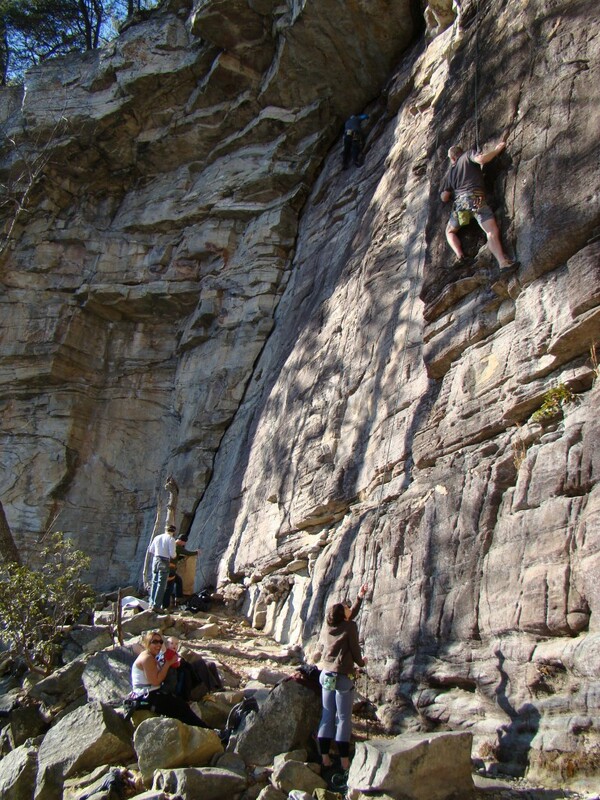 We’ve been doing a lot of bouldering recently, but this weekend we decided to rope up at Pilot Mountain. Incredibly enough, it was the first we’d done any roped climbing since October when we spent several days at the Obed in Tennessee. Today turned out to be a darn near perfect day – despite how much I enjoy bouldering, I’d forgotten that nothing beats tying into the sharp end of a rope! We started the day in the Three Bears area. It was COLD!!! I was starting to second guess our decision to come…My hands were so numb on PaPa Bear (5.10) that I realized I could have been pulling over the roof and onto a spike strip and not have known it. It took about 20 minutes for my fingers to feel normal again after lowering down (hmmm…overgripping much?) However, by the time we moved over to Gentle Ben (5.10a), it was significantly warmer, and the rock felt much better. Considering how much rain we’ve had recently, we were shocked to find the amphitheater dry, so we decided to take advantage of it. 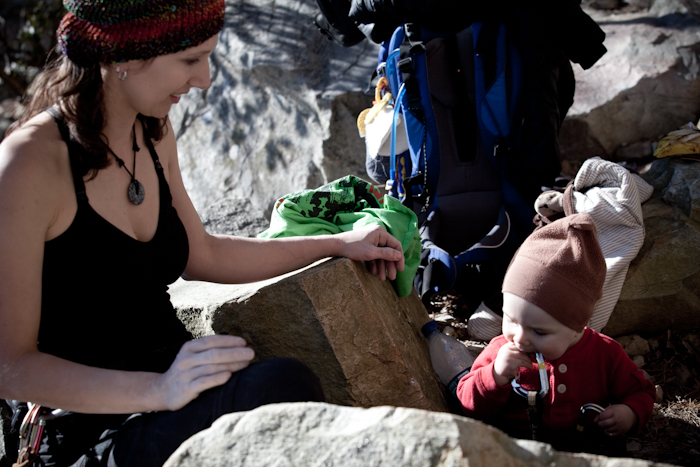 I got on When Shrimp Learn to Whistle (5.11a) for the first time – it had been on my tick list pre-pregnancy, and its the first I’d gotten around to it since then. It looks a lot more intimidating from the ground than it actually is. The first bolt is really high, but probably not harder than 5.7. Keep your head on and you’ll be fine. The next three bolts are really the business, but they are ridiculously close together, so the climb as a whole was very well-protected. The crux for me was figuring out when and how to get the 2nd bolt clipped. A couple of hard moves on sharp crimps on the arete and so-so high feet and you’re done. It took me a couple of tries to work out my crux beta…I did end up pulling the rope and trying again later on, but still fell at the same spot. I’m blaming it on too late in the day – hopefully it’ll go clean next time. I cleaned Surry County Ethics (5.10d), a short mixed route I’d never been on that follows an awkward dihedral to a thin head wall. It was a decent route, but obviously doesn’t get much traffic because it was pretty loose and dirty at the top. The surprise of the day was Pump Street (5.10b), another route that was new to us. Its a toprope line that is directly under the anchors for Cow Patty Bingo (5.9R). It was really fun techy face climbing – its kind of a shame its not bolted, but I guess the logic was that it was too close to Cow Patty? We ended our day on Overhanging Hangover (5.11b), which is classic fun anytime of day, but sure does get the forearms raging when you save it for last. What a great day we had! Steve and I were happy that Jan was finally able to get in a day with more climbing than filming. I think Jan was glad that he actually used the tripod this time, as opposed to just luggling it around like a boat anchor like he did at Asheboro. And this was his wife Crystal’s first time climbing outdoors (aside from a stray trip back in college)…and she’s totally addicted now, so thats always fun to see! It’s also really easy to get in a rut at Pilot, so it was also a pleasant surprise to get on not one, not two, but THREE routes I’d never done before! 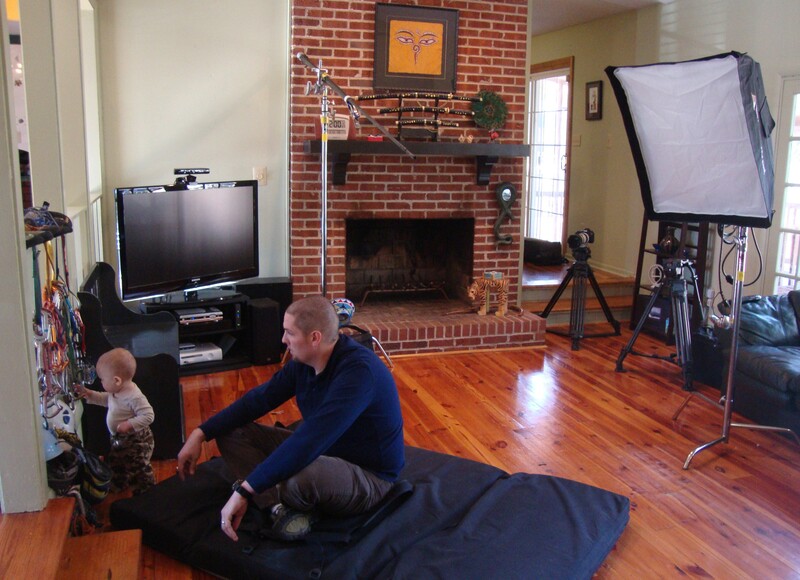 The next day we were able to wrap up all the filming for The Cragbaby Project – the interview! Wow. First of all we had no idea Jan would be bringing so much gear! Thankfully Canaan being the cragbaby that he is was more into sorting the climbing gear that we had perched as a backdrop than the thousands of dollars worth of a/v equipment…After two hours of setup and a couple of last minute wardrobe changes (two of us were really hot under the lights, and one of us was really drooly) just when we were getting good and nervous, Jan was ready to start. Crystal asked us questions about everything from the pregnancy, to changes we’ve made since C’s arrival, to what family means to us and how Steve and I met. Its amazing all the footage that has gone into this project that will end up being less than 8 minutes long! I hope Jan got somewhat of what he was looking for. Steve and I both felt awkward pretty much the entire shoot…Canaan however was another story. His giggle-fits not only provided some much-needed comic relief, but also gave Jan some really cute material. Cragbaby is in charge of the climbing gear while the professionals tackle the photog gear! so i am curious which of the two of you were getting warm and drooly? 🙂 Looking forward to the final project! 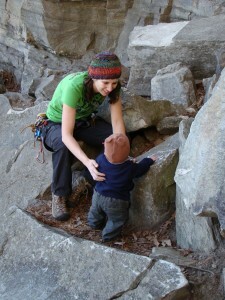 I can’t wait to see the Cragbaby Project!